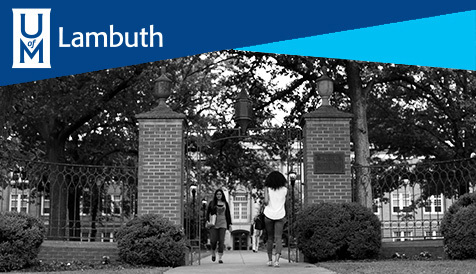 The departmental office is in 219 Mitchell Hall, 3705 Alumni Drive. 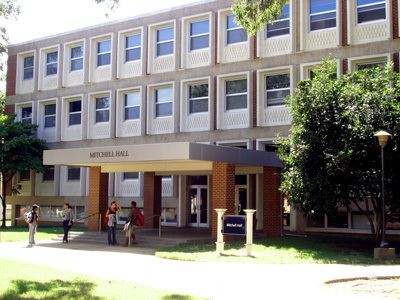 Mitchell Hall is just to the south of the Administration Building and across the Alumni Mall from the University Center, grid E/F-11 on the online campus map. If you are not familiar with the campus, a Google Earth image will show the location of Mitchell Hall at the tip of the green arrow, with enough of the surrounding area to place it in a recognizable context. To get a closer and more helpful view you should adjust the zoom control one step at a time to give whatever degree of detail you desire. As with all Google Earth images, you may change the view to hide or show labels such as street or building names, change to a map instead of an aerial photograph, print the image, or e-mail a link to the map to yourself or others. As an alternative, you may get an aerial photograph from Google Earth that shows Mitchell Hall and its surrounding area already at a fairly detailed zoom level. Mitchell Hall will be shown at the tip of the green arrow, as before. You may change this view in the same ways as described above. The closest visitor parking is in the parking garage and metered spaces at 505 Zach Curlin, grid H/I/J-11 on the online campus map. You may wish to begin your campus visit at the Visitor Information Center at 3641 Central Avenue (901.678.2040), where short-term parking is available. The center can give you detailed map directions and information about the university and its programs. To help you find your way around campus, the university’s online campus map will give you a photograph of any building on which you click.